The front page of this issue of the Topeka State Journal includes several articles related to the desegregation of schools as mandated by the Supreme Court ruling in the Brown v. Board of Education court case. This court case was composed of five cases from the states of South Carolina, Delaware, Virginia, Washington D.C., and Kansas. These cases were grouped together under the name of the lead plaintiff in the Kansas case, Oliver Brown. The article titled "Supreme Court Refutes Doctrine of Separate but Equal Education" includes excerpts from the text of the Supreme Court's ruling. 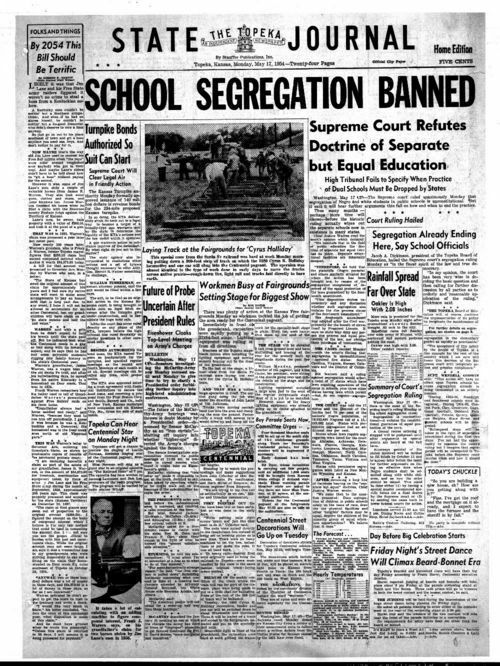 The article titled "Court Ruling Hailed: Segregation Already Ending Here, Say School Officials," addresses how the Topeka Board of Education had already begun integrating its elementary schools (at this time both junior high and high schools in Topeka were already integrated). The article "Summary of Court's Segregation Ruling" provides a brief synopsis of Chief Justice Earl Warren's ruling. Since several articles are included on this front page, it would work particularly well within classrooms discussions about the text of the ruling and its implications for the Topeka school system. For instance, students could use the article titled "Supreme Court Refutes Doctrine of Separate but Equal Education" to discuss how the Brown v. Board case overturned the ruling of Plessy v. Ferguson (1896).